Cardiac arrhythmias affect 2 million people a year in the UK . Atrial fibrillation, the most common type of arrhythmias (80% of cases), is associated with a 5-fold increase in risk of stroke . Other types of arrhythmia include ventricular tachycardia and ventricular fibrillation which are responsible for 80% of sudden cardiac deaths , the main cause of death in the UK (~100,000/year). Radio-frequency (RF) ablation (RFA) procedures are clinically available to treat the majority of cardiac arrhythmias, including atrial fibrillation and ventricular tachycardia . RFA uses catheter-based localized delivery of radio-frequency energy resulting in localized tissue heating (temperature increase of ~30-50°C for ~60sec) and permanent tissue destruction (necrosis). The aim of RFA procedures is to create permanent tissue destruction of critical tissues/pathways of the heart causing arrhythmias. This is often achieved by creating lines of permanent ablation lesions to electrically block/isolate these critical sites. Currently, 30-50% of RFA procedures fail due to the incorrect location/extent of the permanent RFA lesions. Furthermore, RFA procedures may have severe complications including cardiac perforation which can arise from steam explosion occurring when tissue temperature exceeds 100°C. Current real time RFA guidance systems (X-ray, electro-anatomical mapping) are unable to characterize and monitor tissue temperature and extent of permanent RFA lesions. Indirect parameters such as RF power/duration, catheter tip temperature, catheter contact force/impedance are monitored during RFA but have limited predictive values of tissue temperature and permanent RFA lesion extent . Notably, the discrepancy between the catheter-tip temperature and tissue temperature can be >30°C, particularly with irrigated-tip catheters . Therefore, real time monitoring of tissue temperature and prediction of permanent RFA lesion extent is very likely to improve the outcome and safety of the procedure. Magnetic resonance (MR)-thermometry, using the proton resonance frequency shift technique, is a non-invasive MRI technique which enables real time pixel-wise assessment of temperature, deep in tissue . This technique exploits the linear relationship between tissue temperature variation and MR-signal phase variation. Permanent tissue destruction can be predicted using the concept of thermal dose (thereafter referred to as MR-dosimetry) which is based on temperature elevation and time of exposure . Cardiac MR (CMR)-thermometry/dosimetry thus has the potential to provide volumetric temperature and thermal dose information over the entire ablated area (and not only at the catheter tip). However, existing techniques remains associated with significant limitations including a long acquisition window, insufficient spatial resolution, and sensitivity to physiological motion [8-10]. 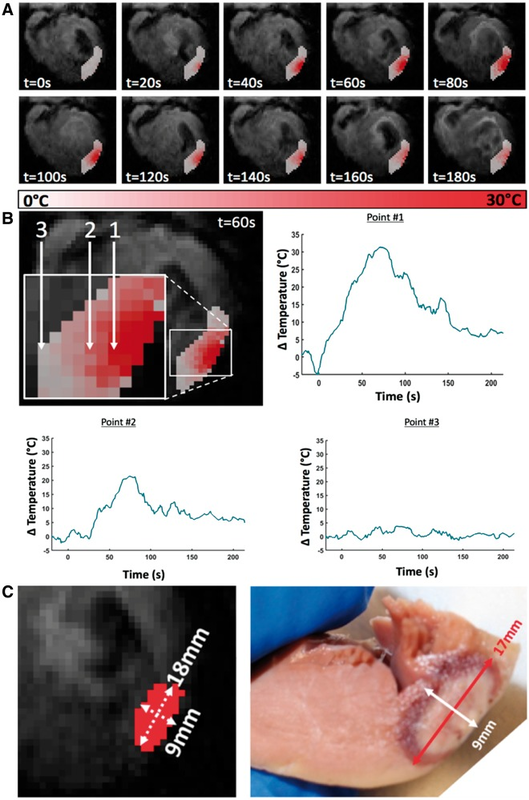 In this project, the next generation tools for advanced real-time monitoring of ablation lesions during magnetic resonance imaging (MRI)-guided radiofrequency ablation of cardiac arrhythmias will be developed. This project will involve the development of novel MRI acquisition and reconstruction methods to address the aforementioned challenges and improve accuracy and precision of temperature mapping and predicted ablation lesions. The developed methods will be evaluated in phantom experiments, healthy volunteers, and both pre-clinical and clinical studies. Figure: In vivo Δtemperature maps (A) shown at different time points relative to the start of the RF heating. Localized temperature elevation can be clearly visualized on the epicardial side of the left ventricle. Temporal profiles (B) obtained using CMR-thermometry during epicardial ablation in swine. A maximum temperature elevation of 35 °C was observed in a pixel within 2 mm of the catheter tip—Point 1 (relative to a more remote pixel in myocardium >8 mm away from the catheter tip—Point 3). No significant temperature elevation was observed in a pixel located in a remote area. 2D lesion dimensions measured using MR-dosimetry (C) correlate well with measurements on gross macroscopy with mild overestimation of lesion width.